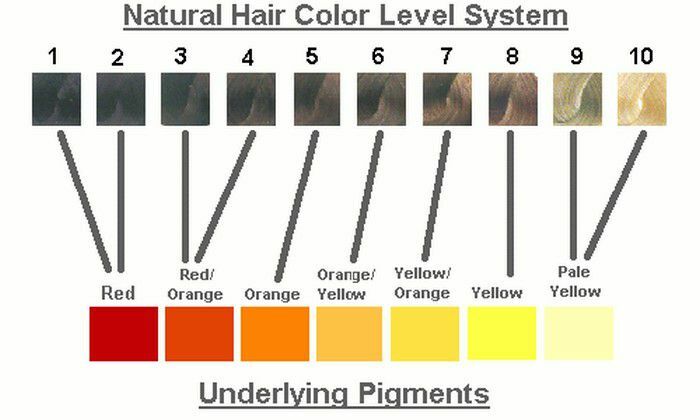 The chart above shows the natural hair levels and their underlying pigments. Underlying pigments are the natural pigments that make up every hair color. When formulating hair color, you must take into consideration the underlying pigments and how they will act. Many stylists throw the term around "use it, or lose it" when referring to underlying pigments. This is because you will need to determine if the underlying pigment will help or hurt your desired outcome. If you are looking to achieve a cool beige blonde on natural level 6 hair, then in this case you would lose the underlying pigment, and work to cover up the warmth that will inevitably come out in the hair when you lighten it. Keep in mind that you'll generally have to be aware of underlying pigment when you are lightening two shades or more from the natural hair color level. You won't have to worry about it when going darker than the natural level, as there will be no threat of the color appearing or effecting your formula. You will refer to the color wheel when it's time to decide which color to use to counteract the underlying pigment. Studying the color wheel and knowing which tones to use and when, will help you to formulate quickly and easily. For example, that cool, ash blonde that we were trying to achieve above, would require the addition of blue and green base colors to be added to the formula. These tones counteract warmth and will give you the cool results you desire. The beauty of hair color is that it's basically a set of rules, and though there are a lot of them, if you follow them correctly, you can usually determine what the final results will be. The other great thing about hair color, is the fact that if you do mess up, there is almost always a fix. You're client might not be too happy but you can handle them, right? What Does High Lift Tint Mean?